Had a good, busy day at work, but felt sooo tired. Went to the cinema with a few others from this evening, to see The Green Book. Excellent film. Some of the audience even applauded at the end - something that I normally hate and makes me cringe - and I was almost tempted to join in. I didn't though. Caught the train at Cannon Street, then changed at London Bridge. 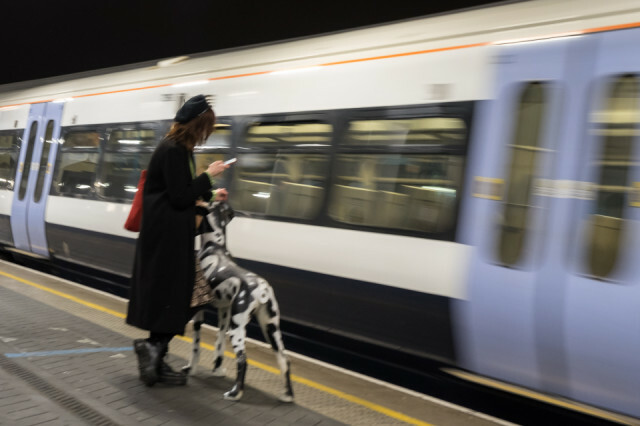 Spotted this lady and her new dog waiting for the train - attempted some very surreptitious photography and ended up with a blurry effort as a result. It's not a real dog, by the way.